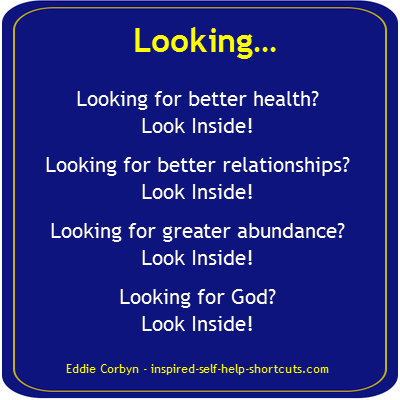 Inspired Free Self Help Shortcuts To Changing Your Reality! The Life Experience That You Say You Prefer! Congratulations for arriving on this inspired free self help page. The fact that you’re reading this page tells me that you’re ready to allow yourself to begin remembering the greater truths of life. And that perhaps you’re ready to start thinking in ways that will grant you more freedom and joy in your life experience too! Remembering these inspired truths will enable you to change your life experience into one that you say you now prefer. On this LOA (4) page of the Law of Attraction program you'll rediscover many tools that you might need to use in order to help to set you free from the self-imposed limitations of your mind. On this inspired free self help page I’ll outline what you may need to do in order to change your current experiential reality from one that you say you don’t prefer into one that you say you do prefer. The keys I’ll highlight concern thinking about and changing your beliefs, by redefining them, and trusting in yourself and in your Universe. While you may have found this page by typing 'free self help' into your web browser and while all of the information provided on this inspired website will always be free, there are two investments that are required from you in order for you to receive the full benefits of these ideas. Your first investment will be the time you dedicate, thus to gain the most from this website you might have to read and re-read many of the pages and you’ll definitely need to practice what's being said here. Changing your lifelong beliefs may not happen overnight, but if you stay the course and work on your beliefs and definitions then change will happen! Your second investment is concerning the thinking you’ll have to do. Actual thinking is necessary, not the usual repeating of words and clichés spoken by others. In order to understand, to integrate and to anchor this new understanding into your mind you'll need to think for yourself and to use discernment to know what serves you best. The more consciously aware you become, the better reflections you'll see! Even though we're responsible for creating our own experience of reality if we’re unaware that we do create it, it might seem as though our experience of reality is out of or beyond our control. And then we might act as though it is by complaining and blaming others for our misfortunes and endless other things. While operating from the usually common "state of victimhood" we still create our own experience of reality but in an unaware (unconscious) way. This leads to experiential realities which might not necessarily be versions of reality that we’d create were we creating in an aware (conscious) way - either way, we do always create our own reality experience. If you’re not clear that you create and are thus responsible for every part of your own experiential reality or you need more information and clarity, it’ll be helpful reading this self help info page before continuing on this free self help page. Now, let’s explore the actual physical side of being the change that you say you desire. And how and why you actually are that change, that New You, which you say you now want to experience in every second of your existence. Scientifically, we know that the cells in our body are continually changing 24 hours per day and 7 days per week. Cells are dying off and new cells are being created or born in every Nano second of our physical life experience here on Earth. Even the oldest cells, our brain cells, have a maximum life span of 7 years. Therefore, it logically follows that in every 7 year period all of the cells which compose our physical body are completely renewed and replaced by new ones, thus a New You is created every 7 years. every 7 years, thus a New You is created every 7 years. Now, this raises questions like: if I got a physical injury 21 years ago and I have a completely new body every 7 years, how come my old injury still exists 3 bodies later? The answer is it’s due to your psychological beliefs, the story that you tell to yourself and to anyone else who will listen. To be the change, to be the new person that you say you want to be, you have to let go of the past and refrain from thinking about and telling your poor old me story over and over in your mind, to yourself and to others. If you really look into it you’ll discover that the poor old me story is really nothing more than self-importance masquerading as self-pity anyway. Could it be time to get over this now? Is it time to simply let it go along with that former version of you who, after all, no longer exists? The meaning implied by these inspired free self help shortcuts is that you can always rely on your Universe to bring an exact reflection of your definitional beliefs, feelings, thoughts and behavior (your-vibrational-state-of-being) to you, without fail, always. And that nothing can change externally without a corresponding change in your state of being. Consider the analogy of the reflective quality of a mirror. A mirror's primary quality is one of reflecting back to you that which you are in any moment. A mirror cannot show you who you’d prefer to be, but once you change then the mirror will reflect that change back to you. Your Universe works in a similar way to a mirror! Your Universe reflects your world to you, thereby showing you who you’re currently being through your vibrational offerings. Thus, if you want to see changes in your physical reality then you must be the catalyst that causes that change. You must realize that you are the operant power of your Universe. Your Universe knows everything about you and who you’re being vibrationally. And as your reflection it has no choice other than to reflect any and all changes you make within your being back to you. Your job is simply to trust that your Universe will bring those changes to you through your life experience! This means that in order to see positive change you must be positive first. And you must believe first that that’s how it works before seeing the evidence of your belief and not the other way around, because that’s not how the nature of belief works. You’re always the cause of any and all reflections in the Universal mirror of your life! Once you’ve decided which changes you want to see, trust and believe in your Universe and don’t get in its way with your doubtful negative thinking or your imagined negative scenarios etcetera. And remember that your Universe doesn’t need your help; it only needs your wish, your order or your command. So once you’ve placed your order by being the change leave the rest in the hands of your Universe. Believe in, rely upon and trust your Universe to fulfill your order while relaxing and enjoying your life! Now, though studying what’s being said in these inspired free self help shortcuts and on this free inspired website, you now understand and believe or at least you have a better idea of how conscious deliberate reality creation works. Perhaps you believe that the law of attraction is real and you’ve had some success, but then you notice some old patterns that you thought were gone reoccurring within your reality. You might even seem to be reverting back to your old ways or some old issues may be resurfacing in your life. In order for your personal Universe to change completely, you must first show the Universe that you’ve really changed by how you respond to the outward circumstances of your life. The outward reflection can only permanently change once the inward movement of your beliefs, emotions, thoughts and behavior has really changed! Changing your definitional beliefs changes reality experience! Inspired Free Self Help Shortcuts to Knowing if You've Really Changed. Option (A) means: you’ll travel by air and the cost of that journey is US$350 and the journey time is 1 1/2 hours. Option (B) means: you’ll travel by taxi, train and another taxi and the cost of that journey is US$150 and the journey time is 10 hours. You’ve made this journey many times before, and while in the past you would always have preferred the faster more expensive option (A), previously you always took option (B). Once again, you need to make the journey from (X) to (Y) as outlined above. Now, with your new understanding of how your Universe works, do you choose to travel by air as you prefer or by taxi/rail/taxi as you say you don’t prefer? Think about the message you’re sending to your Universe. In choosing option (B) you’re saying: No. I can’t choose option (A) because I don’t trust my Universe. I don’t believe that my Universe will support me in the decision I’ve made to step up and go for the option I prefer. That is to say, you doubt how your Universe works and you doubt that it will support you, even though through the mirror analogy given earlier you know how it works. Put another way, you’ve placed all of your trust in a belief that doesn’t serve you rather than in one that does. Of course, you have your reasons for choosing the option you don’t prefer and those are valid reasons for you, but like I said earlier you are the catalyst needed to create the change you desire in your life. Any and all circumstances in your life right now are there because of your behavior that's dictated by your beliefs, feelings and thoughts - how you've defined reality to be for you - and for no other reason. The inner always creates the outer and not the other way around! If you’re faced with a choice similar to the one in the previous example and are determined to make changes in your life, choose the decision time wisely and get the timing right. Think the options through and be aware of how you feel and which option you’d really prefer. Leave the actual time of making the final decision of choosing your option and committing to it until you’re in a very good and positive mood, a happy state. This is important because if you make the decision to step up, but at the same time you infuse that decision with negative emotion or fear, again, that’s the message you’re sending to your Universe: Yes, give me more of that and so the essence of more of that is now on its way to you! For instance, let’s say you decide to step up and go on holiday because you believe that your Universe will support you by replacing the money you spend on your holiday. However, at the time of making the final decision to go on holiday you hold worry and doubt about all the things you’ll need to do (in your estimation) upon your return. So you go on holiday and have a great time. And before you go or upon your return, sure enough you find that the money you spent returns to you - all good so far. However, due to your negative thoughts and emotions concerning all of the things you’ll need to do upon your return, sure enough upon your return you find that some things have gone wrong and now you’re faced with worry and stress. So as you expected your Universe took care of your finances, however also as you expected your Universe made sure that upon your return you’d be faced with worry and stress. You see, your Universe must bring exact reflections of the state of your being back to you, it has no choice. Click this image to get a FREE PDF document containing a very powerful list of Awareness Keys. Once the new window has opened up you can read the document or save the file to your computer. Enjoy. Referring to the inspired self help free shortcuts (X), (Y) example above, please just give this a go. You don’t have to start with a monetary difference of US$200 as in that example; it can be for any amount even one or two dollars. The point is that that’s how it works, so start with smaller amounts and work your way up to larger amounts. Every time I step up like that and spend the extra money on something I prefer, almost immediately, within hours, my Universe responds by bringing extra money to me. So not only do I get to choose the option I prefer but I get the extra money I’ve spent back very quickly as well.